"Ancient Chinese Proverb," and my father in law's life mantra. I have learned volumes from my wife's father in terms of initial planning and slowing down when I work in the shop. Occasionally, though, I catch myself slipping back into my old habits. Whether it was lack of sleep (teething baby), or just lack of user head space (brains), I made a mistake this weekend so heinous that it caused me to check and assure myself that I had at least put pants on that morning. Realizing that my pants were in fact where they should be, I turned my attention back to the ugly atrocity at hand. I had managed to not only mark, but to happily cut (probably with a stupid grin on my face) several dovetails totally backward, you might want to hide your children's eyes from the horrific images below. I was re-marking these when I decided I'd better own up to what I had done. I really enjoy timber framing tools. 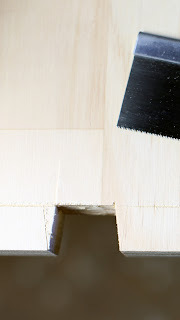 Maybe my fascination has something to do with the enormous, almost novelty size of timber frame tools compared to the chisels and gouges I typically use. This might be akin to my alternate fascination with tiny espresso cups... okay, I just like to pretend I'm a giant. Fortunately for me, H.O. Ibbitson & Co. and Richard Melhuish Ltd. forged some wonderful, similarly designed swan neck mortising chisels a long, long time ago. These were one of those finds that had me all giddy because I had been looking for one to restore for my friend as a Christmas gift, and here were two together! I have finally had a chance to finish reading the Christmas gift I received from my sister. I was excited when I opened this set of books "Tage Frid Teaches Woodworking: Special Limited Edition with DVD Profile," produced by Taunton Press. "Book 2 - Shaping, Veneering, Finishing"
"DVD - Tage Frid, A Fine Woodworking DVD Profile"
I will try my best to give focus to these videos in order fill them with relevant information without making them ridiculously long and un-watchable, so... I guess that means I'll have to start with the next one? Wish me luck. The preview frames I get to choose from for these videos on YouTube are always so great... Elvis impersonation anyone? Love was not an original tenant of the feast of St. Valentine until Chaucer wrote about birds unexpectedly mating on "Seynt Volantynys Day" in (or around) 1382. In fact, nothing is really even known about St. Valentine including which martyr he actually was (there were apparently many named Valentine). Due to some miserable experiences on previous such holidays, I have never been much of a Valentine's Day celebrator (fortunately for me, neither is my wife). I decided that this year I would give new meaning to this vastly overrated "holiday." Love is still part of my New Order of St Valentine's Day or N.O.S.V.D. (okay, so the name needs some work), but this isn't the sappy cartoon hearts, gross chalk candy and creepy naked cherub love that surrounds Valentine's Day now. The concept behind N.O.S.V.D. is the love for hand made objects and the tools used to make them. I was recently reading an article in the February issue of Scientific American about the impracticality of a cheeseburger. The article's author, Mr. David Wogan, sites a blog entry by Mr. Waldo Jaquith in which he attempted to make a cheeseburger from scratch. Apparently, what he found was that not only were the ingredients harvested or slaughtered at different times of the year, but that it was extremely expensive to produce each ingredient from raw materials (including growing the delicious veggie toppings). This got me thinking about the "ingredients" or materials we as woodworkers often use in our projects.